Kaiji Ito (Tatsuya Fujiwara) is a listless 30 year-old compulsive gambler. When a friend whose loan Kaiji promised to guarantee skips his payments, Kaiji finds himself confronted by a local loan shark and given two choices: pay up the millions of yen in debt and interest, or take his chances on a high stakes card game on a cruise liner. When that escapade fails Kaiji finds himself forced into indentured service building a vast underground city – with only one chance to make it out. 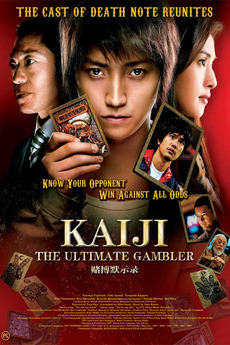 Kaiji: The Ultimate Gambler is one of a wide array of live-action adaptations of popular manga. In this case it adapts Fukumoto Nobuyuki’s Ultimate Survivor Kaiji, a long-running serial that’s been published off and on since 1996. It joins other live-action films of recent years including Bunny Drop, Rurouni Kenshin, Death Note (which shares much of this film’s cast) and several others. I think it’s important to remember that the film is adapted from a manga, because taken on its own merits it’s ridiculously unbelievable, emotionally over-the-top and utterly silly. The film does have some interesting things to say about perceptions of wealth. On the one hand, all of the rich people in the film are positively diabolical, forcing debt-ridden poor people to risk their lives and die for their own amusement. On the other hand, it also seems to argue that poor people will always be poor, because they waste their lives waiting for the one big break rather than actually work to pull themselves out of poverty. I’m not certain either accusation is true, and it creates a rather strange film. The villains are irredeemably corrupt, and the heroes are pathetic and incompetent. Who is the viewer supposed to care about? Tatsuya Fujiawara plays Kaiji. He’s an odd actor. I’ve seen him in numerous films, notably Kinji Fukasaku’s excellent Battle Royale, and he’s always seemed to operate in one of two modes. It’s like there’s a switch on his back: flick it left, and you get sullen moping, flick it right, and you get screaming histrionics. He doesn’t seem to have a range in between. This actually serves him well in this film, since he is for all intents and purposes playing a cartoon character. The situation is incessantly hysterical and over-the-top, so to a large extent his performance matches its surroundings. The film goes to remarkable lengths to make a simple card game an edge-of-your-seat experience. They are brilliantly shot and paced, but at the same time there is always that element of doubt over whether the situation really warrants the treatment it receives – or indeed the amount of time the film spends explaining a character’s rationale for each card played. One assumes the source manga did exactly the same; for one thing it would explain how the story has been extended into so many volumes. Later set pieces continue to present a highly-strung and panicky line in nonsense, albeit without the full skill demonstrated in the cruise liner sequences. To be honest it’s all slightly awful, but it’s an awful that entertains against expectations and turns out to be weirdly addictive. That ultimately seems a bit of a win for director Toya Sato; at the very least he embraces the silliness wholeheartedly. It is difficult to properly describe this film. There is definitely something of worth here, but quite how anybody managed to pull it together seems elusive. The manga has since been remade in China as Animal World (2018), which removes the story’s second half but adds vigilante clown fantasies. It is probably the more entertaining adaptation of the two, but it is worth seeing both to see the different manner in which each tells a damned weird story. An earlier version of this review was published at The Angriest on 23 July 2014.